How much does it cost for international patents? Note: The following information on patents is presented from the perspective of an experienced inventor. It is not legal advice. To understand how patent laws pertain to your invention and to manage the complexities of patent filings you should consult with a registered patent attorney or agent. Updated July 2016. There is no such thing as an "International Patent" or a "World Patent", no single patent filing that will protect your invention idea in every country on earth. To get patent protection in a given country you need to ultimately file for a patent in that specific country. Obtaining a single patent in each of the nearly 200 countries on earth could cost an estimated $1,000,000 for filing and issuance and another $1,000,000 to maintain the patent for its full term. That's beyond the budget of independent inventors and even most corporations, especially when you consider that patents are applied for prior to a product becoming a proven commercial success. Fortunately, at the beginning stages, the patent process enables you to hedge your bet and keep expenses down to a manageable level. The most basic tool for doing this is a PCT application. PCT stands for Patent Cooperation Treaty. Like the Common App for colleges, PCT enables you to file one international patent application that will be accepted by 150 countries throughout the world. Significantly, the PCT application can be used as a reservation for submitting your patent to specified countries and enables you to delay for up to two and a half years in making the decision on which countries to actually file in. After that period, the PCT application is converted into individual patent applications, one in each country where patent protection is desired. If you already have a complete patent application with claims, filing a PCT application will cost approximately $4000. The PCT application enables you to preserve your right to file international patent applications in any of 150 countries (Taiwan is a notable exception) for a couple of years. The details of the PCT application, its filing requirements, timing, the rights you preserve and other issues, are beyond the scope of this discussion. But if you're thinking of getting international patents, a PCT application is well worth consideration. Typically companies file patents in a few key countries where the invention will be made and sold. As`a point of reference for costs, in the 1990's WorkTools Inc (a co-founder of Invention City) spent roughly US $100,000+ on three patents for the PowerShot® staple gun in the USA, Canada, England, Germany, France, Italy, Sweden, Spain, Brazil, Australia, Taiwan and China. The countries chosen were all countries where competitors were making similar products. A patent covers the rights to make AND/OR sell an invention. One simple strategy to keep costs down is to file in countries where competitive products are made. For example, in theory, if competitive products are only made in China and then sold worldwide, a single patent in China could protect you worldwide. However, it's easier to defend a patent against sellers in the United States than makers in China, so a US patent makes sense too. This concept can be applied to as many countries as your budget will allow. One way to think of where to patent is to consider whether or not royalties on invention sales will likely cover the cost of the filing and maintenance. While PCT makes applying for international patents easy, enforcing them remains complicated and expensive. When considering whether or not the expense of a patent in a given country is justified the realities of enforcement should be considered as well. In the United States and Canada, Western Europe, Japan and Korea patent enforcement can be effective, with the US being the easiest place to take action. China remains difficult but as of this writing (July 2016) is much better than in the past. Enforcing a patent in India, Russia, Brazil and South Africa, unfortunately, remains exceedingly difficult at this time. A patent gives the inventor the exclusive right to make, use or sell his/her invention (and to license and sell it to others who will make, use, sell it). A patent covers details. A valuable patent covers details that are necessary for a user to enjoy the benefits of the invention. A worthless patent covers details that don't matter - someone can make the same product in a different way that "gets around" the patent and the user would be just as happy. Patent offices don't judge whether or not a patent has value. Claims. Claims detail what is actually protected. And patents are complicated. WorkTools won a patent lawsuit because, among other things, the patent claim used the word "a" instead of "the". Even if you have a validly issued patent it can be challenged and you might lose! The legal system recognizes that patent offices sometimes make mistakes. This means that the only way you truly know if a patent is valid is to have it tested in a lawsuit and in a subsequent appeal. If your patent survives this process then you really know that it's valid. The good/bad news is that patents are presumed valid and most of them are not subjected to this expensive testing procedure... unless... they cover something that is worth a lot of money. The Wright Brothers spent many years defending patents that covered details significant to airplanes. I applied for a patent and had a prototype made. Now I've reached the stage where I have to ask the patent office for searches. As I'm working on a shoestring budget I'm looking for investors to cover the cost of patenting in England, USA, Germany, Europe and Japan. Potential investors want to know how much overall it will cost to have international patent protection granted. Could you please help? Disclaimer - I am not a patent attorney and am not qualified to give legal advice on patent filings, costs etc. That said, my companies, WorkTools, Inc. and Invention City have filed patents all over the world and I can write about my perspective on that experience. Your question has a lot of elements. I'll break them down and address them one by one. It's not clear whether you have filed a full application with claims or a provisional patent that comprises simply a detailed disclosure. Before proceeding with international patents you'll want to have a full application with patent claims. A prototype is critical. It's great that you have one. Hopefully you learned from it, improved your invention and wrote your patent disclosure (and claims) based on the improvements. This is confusing. Patent searches are part of the application process and should take place ahead of the application. A patent search is how you identify prior art. Oftentimes you will find good ideas that you can use in your invention (in expired patents) and even more often you'll find that someone has patented the idea ahead of you. If you haven't found prior art that's close to your invention then you probably haven't looked hard enough or in the right places. It's a great to have investors share the risk with you. 5. ...of patenting in England, USA, Germany, Europe and Japan. Europe has 50 recognized countries of which 27 are in the European Union. This gets to the heart of patent application strategy. 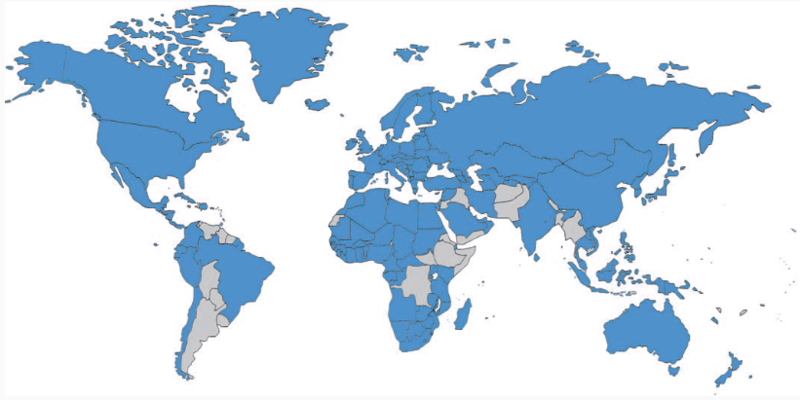 No one applies for patents in all of the 195 countries of the world. How many widgets do you expect to sell in Burma (aka Myanmar)? And are you really going to try and defend a patent in Kazakhstan? or Cambodia? Getting serious, unless you're careful, the cost of patents can quickly exceed any profit you might expect from your invention. The original filing, where you have to fight with the examiner to overcome objections, is usually the most expensive and can run from between $5,000 to $25,000 for the USA only. Patents on the same invention in other countries are more or less copies. Even so, Japan is particularly expensive. But there are some savings when filing in multiple European countries. To patent a simple invention in just four countries, including the cost of the original filing... assuming it's only one patent for a relatively simple invention (many inventions have multiple patents)... in England, USA, Germany and Japan is likely to cost somewhere between $35,000 to $60,000. Part of the cost is translation. Now... before you go filing international patents on an invention that has yet to make a dime you might want to copy the strategy used by many companies and delay the filings until you know that the invention will make enough money to cover the cost. The most common way to delay is to file a PCT application (Patent Cooperation Treaty). If you already have a complete patent application with claims, filing a PCT application will cost approximately $3500. The PCT application enables you to preserve your right to file international patent applications (in any of approx 150 countries except for Taiwan and Argentina) for a couple of years. The details of the PCT application, its filing requirements, timing, the rights you preserve etc. etc are beyond the scope of my expertise. All factors that described above have an influence on cost for international patents.There is a tool for IP budget estimation www.ip-coster.com, it is accurate and free to use.